Suppose someone offered you either a Gibson Les Paul or an obscure Electra. Which would you choose? I know which direction I jumped once upon a time! Back in the day, before the Internet brought cool guitars to your desktop, we used to have the pleasure of snooping out guitars in little out-of-the-way shops. Mac and Joe used to run one such parlor out on Woodland Avenue in Southwest Philly, a low-rent district for sure. After work I’d descend to the Green Line and catch either the 11 or 36 trolley, which dumped me full of anticipation in front of their store. What would I find today – a Hagstrom? A Framus? One night we were hanging out near closing, when a fellow pulled his car up, ducked in and asked if we wanted to buy a Les Paul. To a guitar dealer, there are no finer words. To me (yawn), it was time to leave. Then he added, “Plus I’ve got this here Japanese Electra.” My ears perked up. 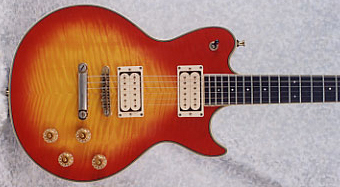 While Mac and Joe ogled the frankly boring mid-’70s LP, I was ogling one of the most gorgeous guitars I’d ever seen. Later I found out it was a 1983 Electra Endorser X934CS. A set-in neck with no heel. Mahogany with a carved maple cap that had flame so deep you got high staring at it. Finished in cherry sunburst, my favorite. Plus lots of that early ’80s brass for sustain. Sustain? These humbuckers, which turned out to be original and American, scream forever, enough to blister the paint off the other guitar. Besides having push-pull pots with coil taps and phase reversal. I’m a sucker for those every time. The fit and finish were impeccable. This was my first encounter with an Electra, and I was hooked. Looking back in the pages of old Guitar Player magazines led me to St. Louis Music. A phone call led me to Tom Presley, the man who directed most of the Electra line through the 1970s and actually designed the Endorser. The Endorser actually was a straight, fancy version of part of the earlier Electra MPC line, which had the cool plug-in sound modules. This guitar, indeed all of the Electras and later Westones were designed in the U.S. and built by the legendary Matsumoku factory in Matsumoku City, Japan, one of the great guitar makers. Matsumoku produced some of the higher-end Aria guitars (and some Epiphones) of the ’70s, and sold its own very fine Westones before St. Louis Music took over the brand name in ’84. Matsumoku also made sewing machines – go figure – and in 1987 or ’88 was bought by Singer, who shut down the guitar operation. The Yen was so expensive by then that it was pretty hard to export to the U.S. anyway. Mac and Joe bought both guitars and continued to “ooh and aah” over the Gibson. I timidly asked how much for the Electra, and they waved their hands as if brushing a fly and said “Three bucks.” I left them to their ecstasy (mental) and, a big grin on my face, quietly slipped out with my treasure to catch the trolley back toward town. This Electra Endorser is still one of my favorite guitars to this day. I was Director of Marketing for Gibson Guitars in the 70’s and early 80’s, before the company was sold to current management. Are you sure it isn’t an X935CS? That’s what I have. I bought mine new in ’84 and it’s still my go to even though I have over 30 others.